Emma is thrilled to have just recorded Fly High, a new song by Michael Mott. Check out her debut performance in the video from 54 Below and listen on SoundCloud. Music & lyrics by Michael Mott. "... 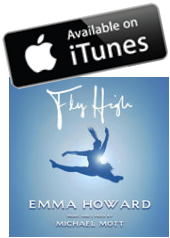 I was commissioned to write a song for a 14 year old Broadway star named Emma Howard. So, last night was the first time we met face to face and the first time I was hearing her sing my words and music. Let me just say, she's PHENOMENAL! She's gorgeous, hard working, determined and on top of that has a flawless chest voice, mix and head voice. So she's in the vocal booth and I'm producing her vocal session from the control room and every take I keep telling her, "Emma, sing less. Tell me the story. Stop thinking about how you sound and focus on what you're saying and I promise the vocal will sound better than you can imagine" ... she DID it! By the end of the night, she just gave over to the storytelling and we captured some magic in there!" Michael Mott, Broadway Composer/Lyricist, on recording "Flying High", the song he wrote for her.